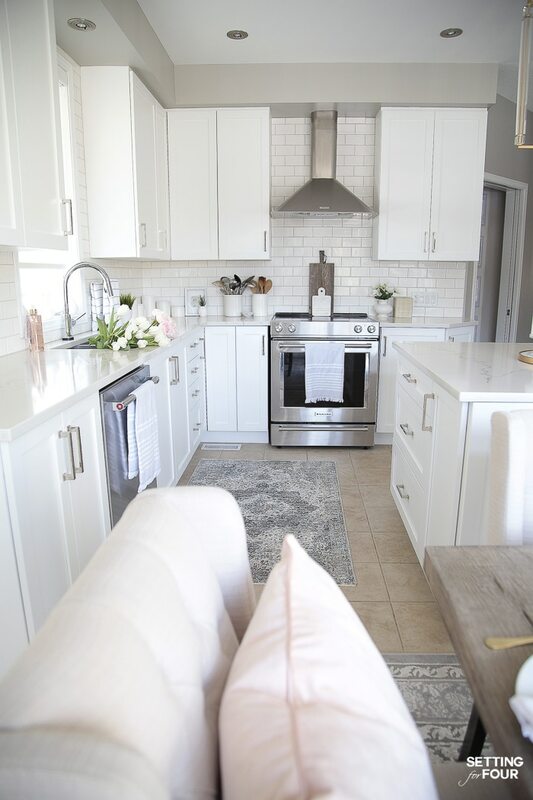 See my light and bright Spring kitchen decor ideas! 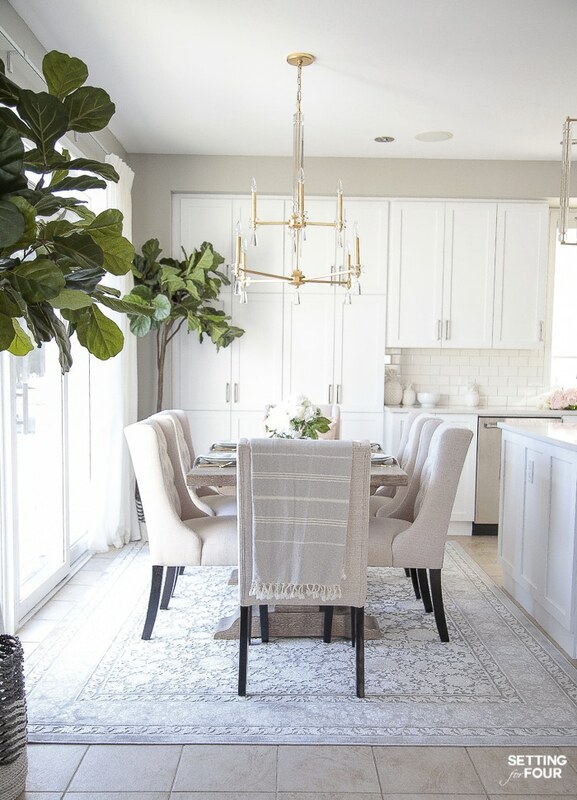 See 30 beautiful Spring home tours filled with fresh new Spring decor inspiration! If you’re coming from A Stroll Thru Life, welcome! Thank you Marty for hosting this fun Spring blog tour! 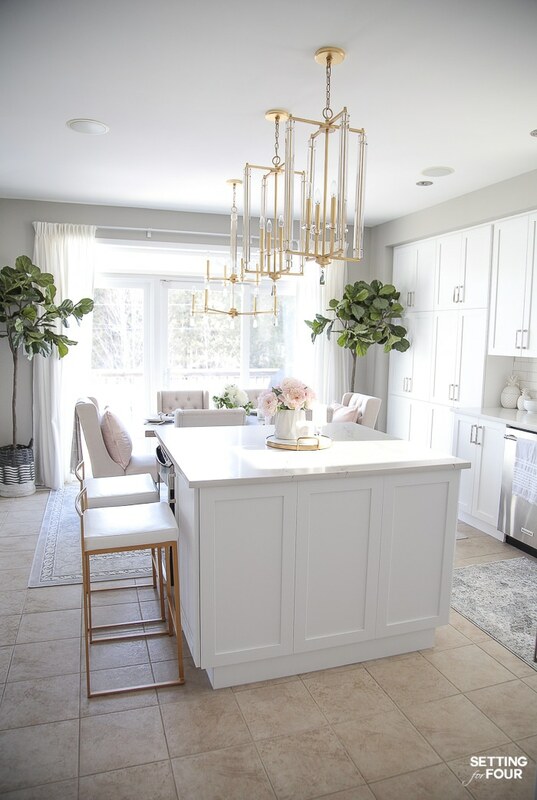 I had so much fun decorating my kitchen for Spring! 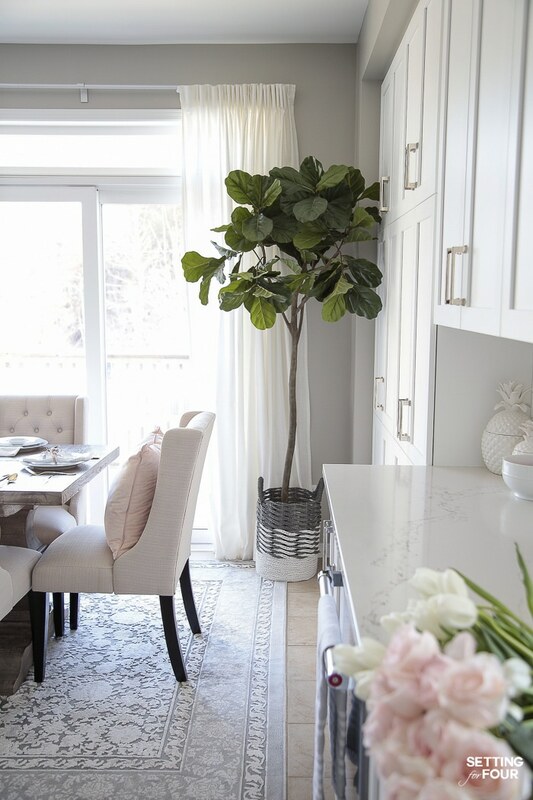 This winter has been the longest ever and it’s been so nice to put away my winter decor and add some light and bright touches to celebrate Spring! 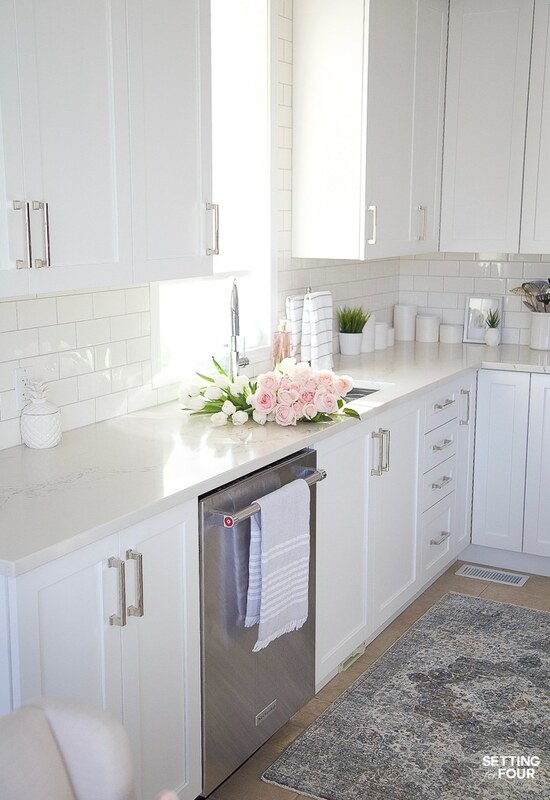 See our recent dark to white kitchen remodel- before and after -it’s such a big transformation! 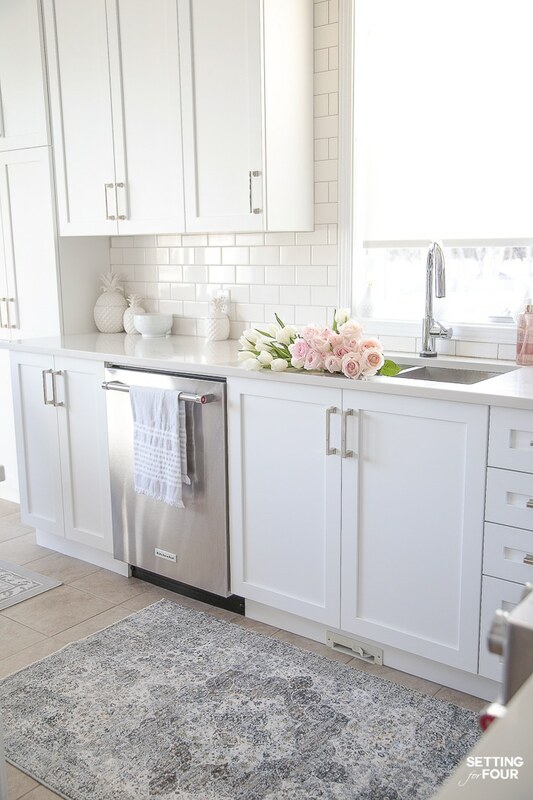 The one thing I’m the most excited about in my Spring decor is my gorgeous new kitchen rug! I love the grays & light blue colors in it! The medallion pattern is a timeless classic look that I love and it’s so comfy on our feet! 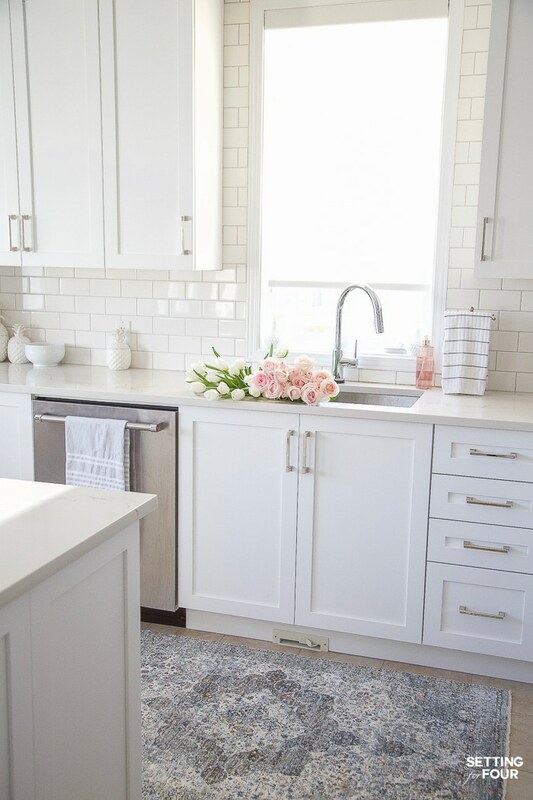 This beautiful rug is so affordable and really lightens up the kitchen! Shop the look! Click on the pictures below and scroll using the arrows! 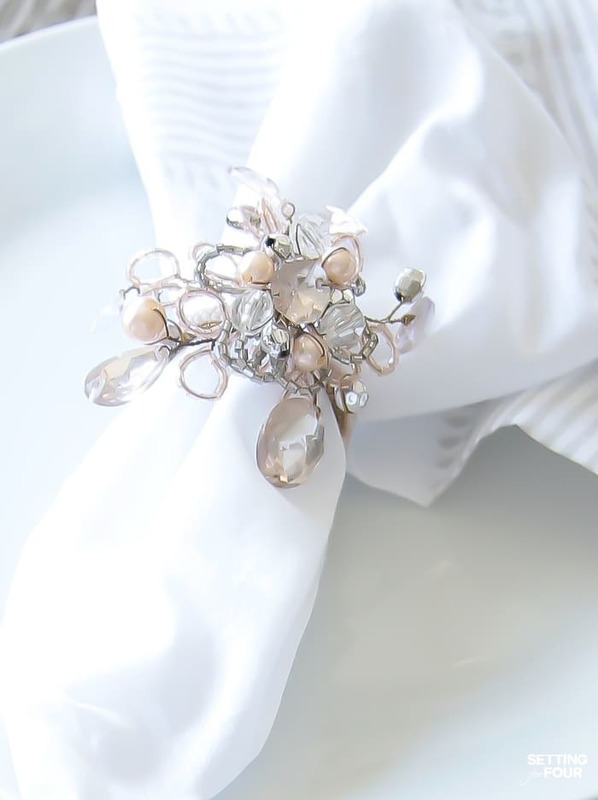 I added a white faux rose and peony arrangement to the dining table and added these new beautiful pink jewel napkin rings. See my kitchen paint color here! Two blush pink pillows add another layer of pretty Spring color. 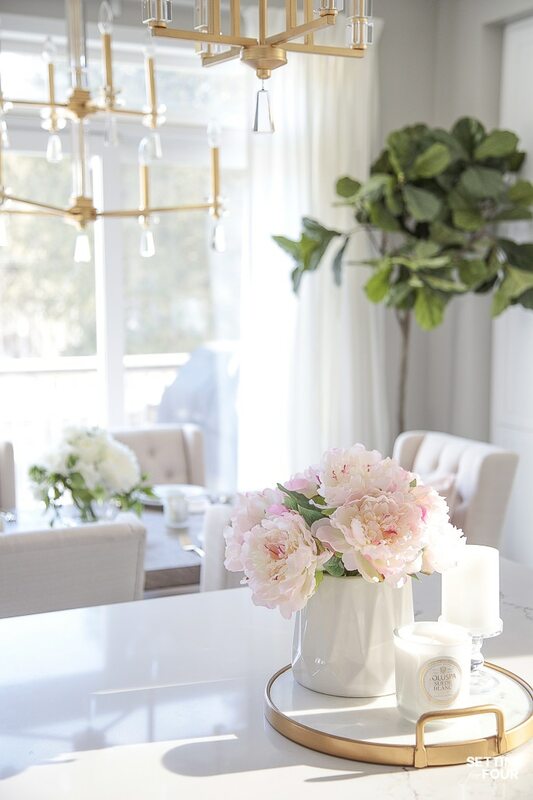 On the kitchen island I replaced my winter florals with these artificial pink peony stems! 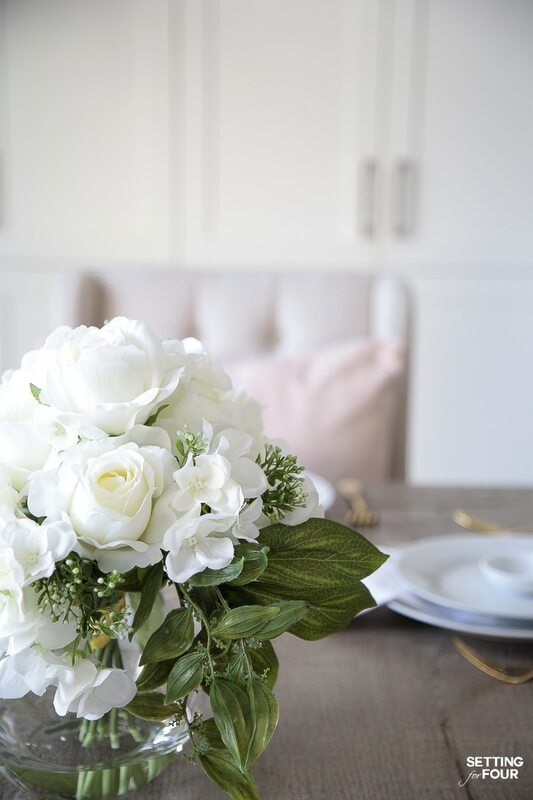 I love creating simple Spring floral arrangements to add on my countertops with gorgeous blush pink roses and white tulips! I also added a vase filled with faux white cosmos and some vases of faux grass for my Spring decor! Here’s another look at my new kitchen rug. I also moved a couple of my fiddle leaf fig trees to our kitchen and popped them in gray and white baskets. 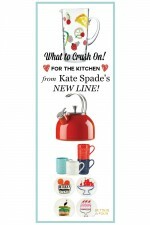 I love shopping my home and moving my decor around from one room to the next – do you? 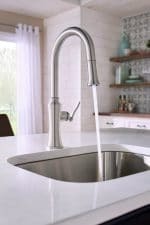 I hope you enjoyed seeing my kitchen tour for Spring! 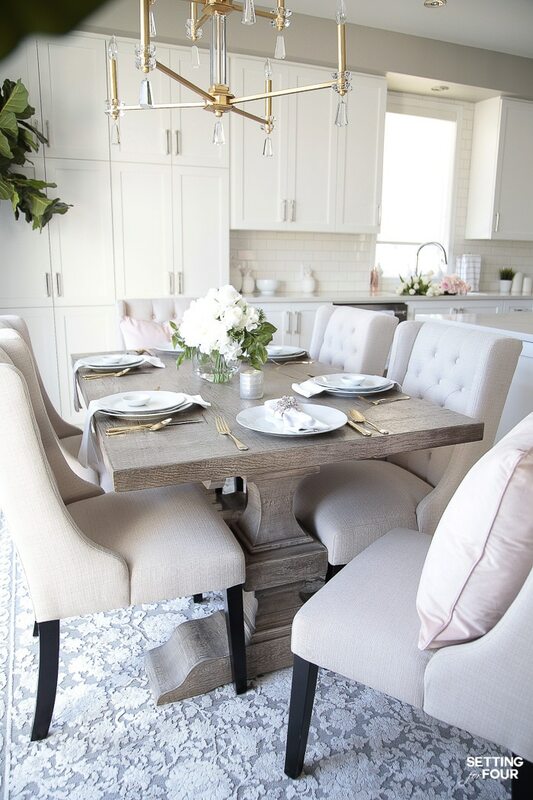 Head on over to my talented friend Julia’s gorgeous home to see her beautiful Spring decorating ideas at Cuckoo4Design! Do you need help decorating your home? 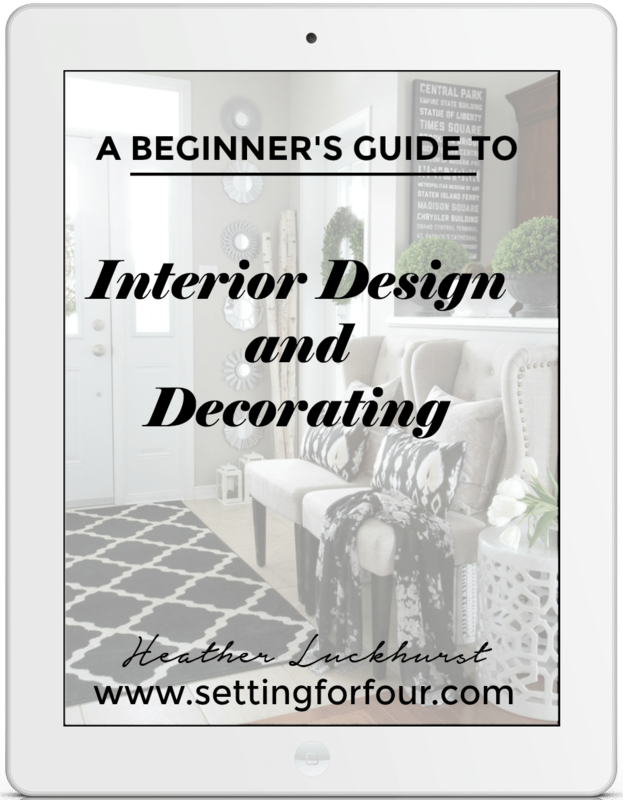 I offer online decorating and color consult services – email me at settingforfour.com for more info! See these 30 Spring home tours loaded with fresh new Spring decor inspiration! I’m drooling all over your beautiful kitchen… Wait, your entire home! So classy and elegant. Love it! Your kitchen is absolutely stunning. I love your door choice and your lighting is Fabulous. What a fun tour, thank so much for joining us for the 2019 Spring Home Tour. 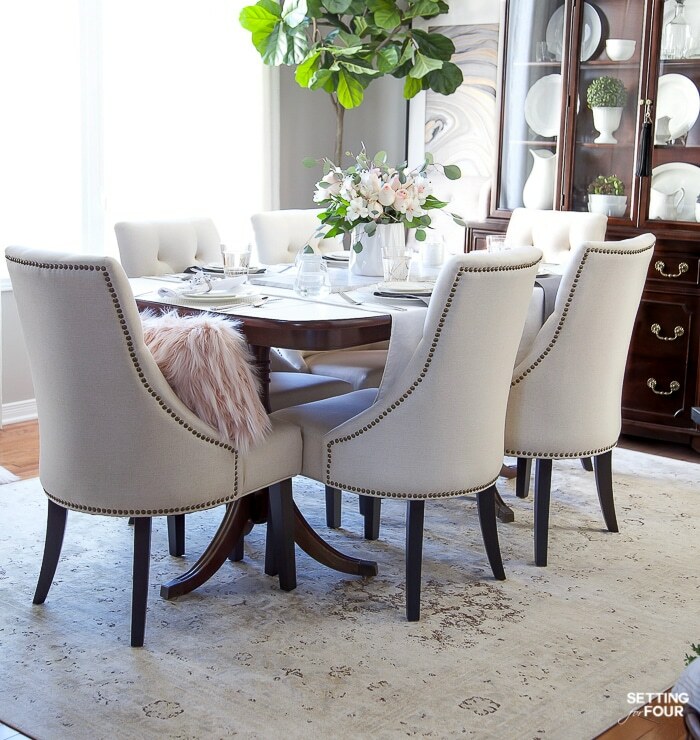 I’d love to know where you purchased your dining room rug and what size it is? Gorgeous kitchen. 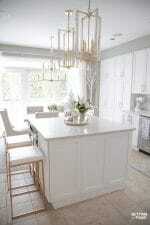 heather- i have been following your blog for so long but don’t remember ever seeing that gorgeous kitchen! it is so pretty. We just remodelled our kitchen Laura! Thank you so much sweetie!! So fun to tour with you again–happy spring! What a gorgeous tour! Your kitchen is just gorgeous. So happy to be sharing this tour with you. Such a beautiful tour Heather! I love your new kitchen! Your home is so beautiful, bright and fresh. 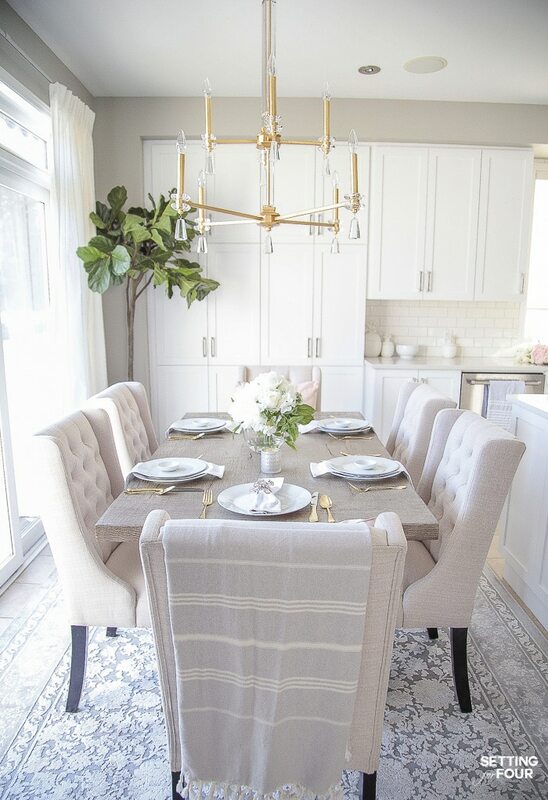 I really love your kitchen table decorations and I am swooning at all of your beautiful light fixtures. So fun being on Marty’s tour with you! 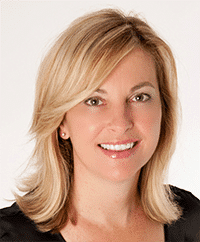 Thanks so much Jennifer – I’m glad you like my Spring kitchen decor ideas! Happy Spring!! Love your beautiful Spring tour! A sink full of flowers gets me every time! 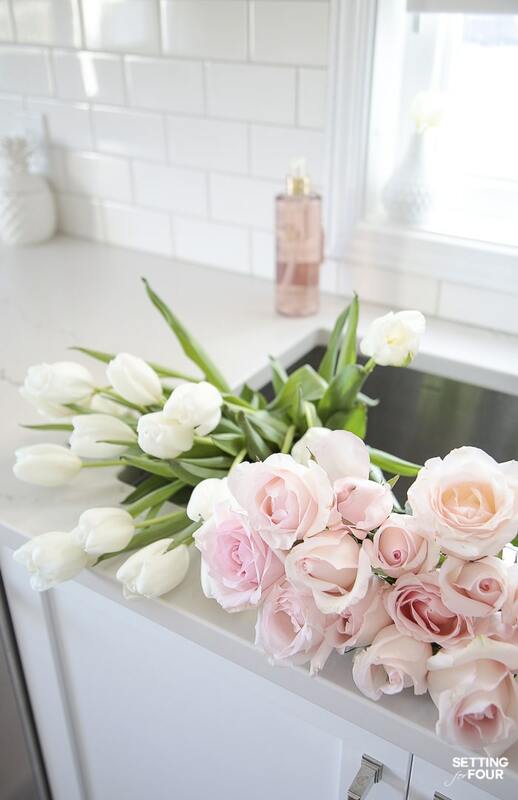 Why can’t our sinks always be full of flowers instead of dirty dishes? 😉 lol! 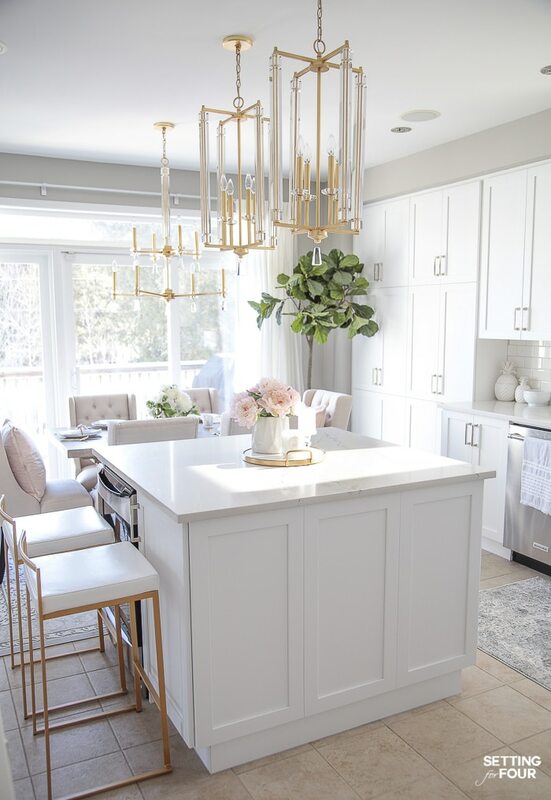 I love your kitchen and all the pretty updates you have added for spring! So lovely! I am swooning over your beautiful roses and tulips and all of the pretty pink accents for spring. 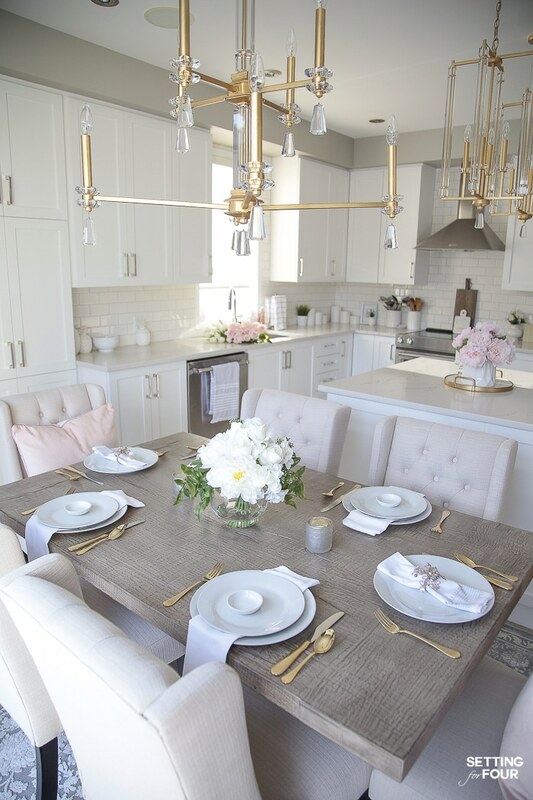 Your kitchen and dining area are so light, bright and inviting. Everything is chic and elegant as always Heather! 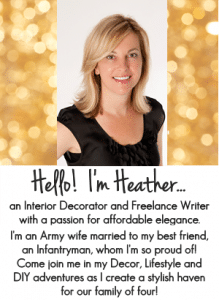 Your kitchen lights are everything, Heather! So pretty! 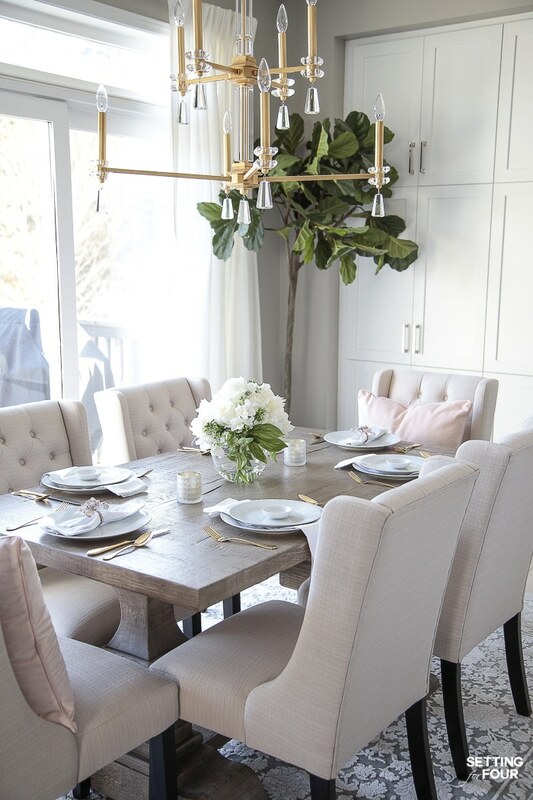 Everything is just so light, airy and beautiful for spring! Your kitchen is amazing!